Well, the flight from SFO-JFK was easy...about 5 hours total time on the plane. Then, from JFK-LHR was a breeze (a movie and a nap helped...along with dinner and breakfast! ); we spent just over 6 and a half hours on that plane. Now, I am sitting in the lounge at the London Heathrow airport, awaiting the next connection to make my way to Munich. I've been looking forward to getting back to this city for some time, and am definately excited for dinner later tonight! How often do you withdrawal from your own thought investment bank? And, what do you do with them when you get them? And, how do you get something done about one of those ideas you have? A lot of the people I work with face a similar challenge: Occasionally they come up with an idea in one place that they can’t do anything about until later. The problem is that while they are thinking of something to do there, they need to be 100% focused on what they are doing here. Every day, you generate dozens of potentials. All too often, these ideas (things to do, people to talk to, E-mails to send, errands to run, etc) disappear from our thoughts as fast as they entered. It just makes sense not to continue thinking about something you can not do where you are. REASON: I'm traveling to Munich on a "mileage run" to maintain airline status* for 2008! RSVP: Let us know, we have a table and want to let them know who's coming! So, I'm landing at the Munich airport early on Saturday and will have time to get a run in and then go to dinner. I leave again on Sunday, so this will be a quick visit! *As much as I fly, American Airlines takes good care of me. I buy a coach-fare ticket, and I usually get to fly in the front of the plane. So, a quick trip to Munich over the weekend makes it all worth it next year when I get bumped up on "almost" every flight! Shift Happens...what are YOU planning for next year? Link: Marci Alboher - New York Times Blog. Goals are more meaningful when they result from your taking stock of where you actually are, which requires you to think about how your life has developed over the past year. If you're thinking of saying "next year is going to be different" sometime next week (like Monday night, for example! ), please read Marci's article by clicking the link above. Her work in identifying some of the significant factors in setting and achieving goals is significant; I highly recommend this article. The Womack Annual Century - A Success! How: just keep on pedaling! 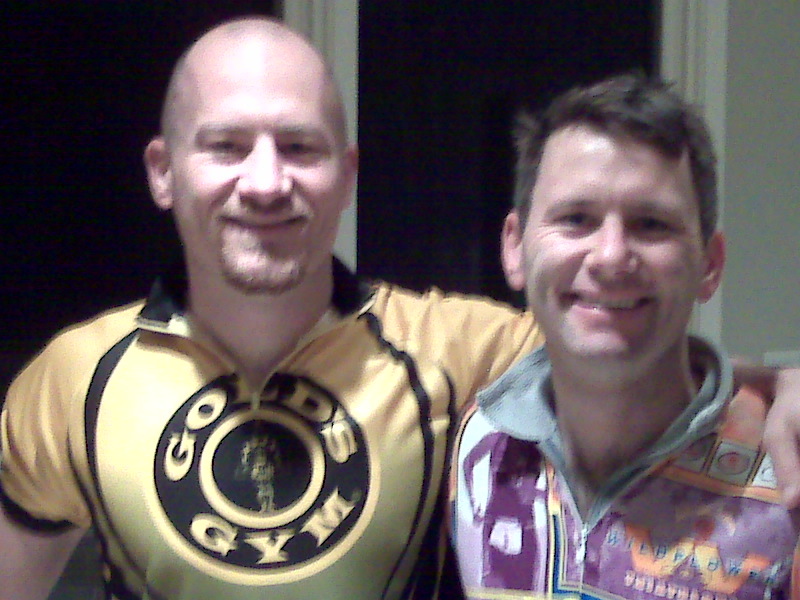 The start of the Womack Annual Century (this was the 5th one Nathan and I have coordinated) was perfect. It was (I'll admit) chilly outside. However, the sky was clear and we knew that we'd be "under the sun" for most of the day. As we had not done much advertising/marketing (except of course the website!) I did not think anyone would join us; to my surprise, Arnold drove up from Los Altos to join us for a portion of the ride! The route this year was great. The roadways are well-maintained, and the traffic was light (two nice things while riding bicycles). We stopped a few times along the way, and Nate took some fun pictures and video. All in all, the ride was a success. Final tally: 6.5 hours of riding, 109.32 miles under the wheels. For some of the highlights, continue reading below! Two days ago, a note appeared on our doorstep here at my parents' home. Ryan, so the note said, has been playing violin for six years and would like to play holiday music for anyone interested. 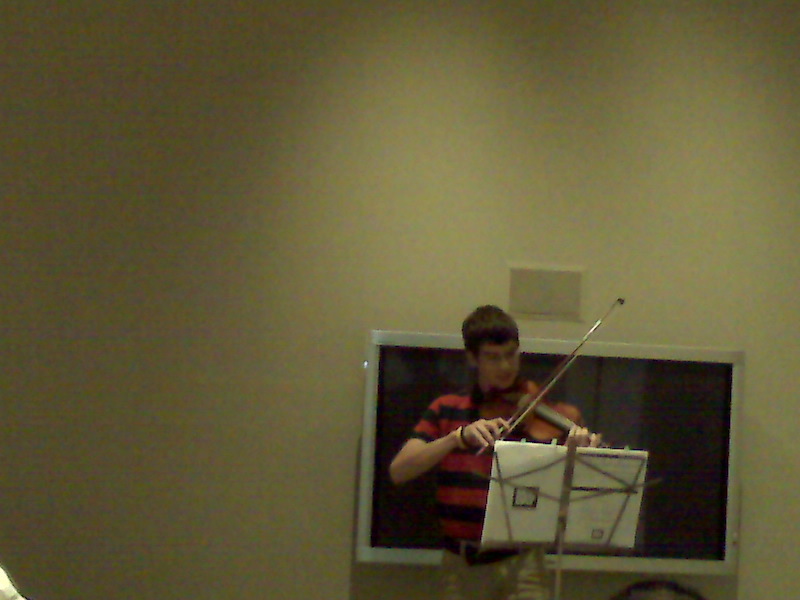 So, before dinner, we're enjoying some great music thanks to Ryan Finton. An entreprenuer AND a musician...kid's going far! The Womack Century is starting! Well, the fifth annual Womack Century Ride is about to start. More to come, when the sun comes up! If you have some time, come on by to say hi! How do you handle the What ifs ??? I was thinking today after reading your Weekly Overview entry about what I have had my head filled the last few day's. They are what I call "What if's". As I have shared in coaching, seminars and other conversations ... I believe we all have a few different things going on that my or may not happen. So what do you do with the "What if's"? I awoke this morning with my mind filled with these things I don't think I should be worrying about, but I am. Some of these things are "wild, and out there," and some feel like solid ideas that just have not happened. What to do with the "What if's". Do you write them down? Do you go through each scenario? They just seem to be consuming unnecessary space and energy. The trick I have used for many, many years now-a-days is more than “just doing it.” I know a lot of people say they get through or around procrastination through such a methodology. What I’ve found is that “just doing it” works when there is a serious time crunch. At the last minute, things MUST be done. What, however, does someone do when they are ahead of schedule, have plenty of time, and are still procrastinating? My cure, start from the end! Make the hard work easy, stop working hard, and get going. Technology savvy and proficiency is non-negotiable. I will share some things you know you need to know, and you don’t know you don’t know to make it easier to get your work done faster and at a higher level of quality with the technology you have. Thinking about work is different than working on that thinking. I will provide very practical AND tactical ways to separate the THINKING you do about your work from the actual time and focus you put on DOING something about that work.